Chelsea BA Fine Art 2015 graduate Anta Germane has been awarded the prestigious Plinth Prize. 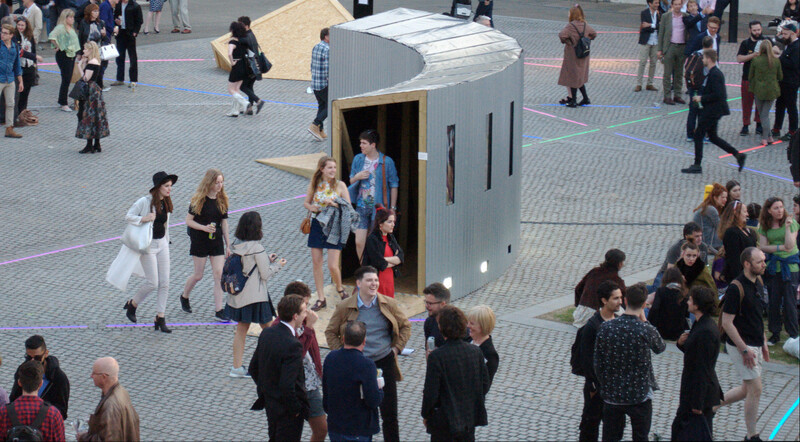 Following on from the success of her work Interactive Tunnel, which was on display in Chelsea’s Rootstein Hopkins Parade Ground as part of this year’s undergraduate degree show, Anta was short-listed as one of eight UAL graduates for the prize and went on to win the award. Anta has now installed a sculpture titled, ‘250 – 252’, which is a new work made specifically for the plinth which is usually the home of Chelsea’s Henry Moore sculpture, currently on loan to Yorkshire Sculpture Park. Anta commented: “For the Henry Moore Courtyard plinth, I have created a large light installation. A combination of steel and glow wire forms the shape of a 19th century ship main mast. Through its appearance, I am referring to the history of the site where the plinth is located and the memorial behind it. The site already has its meaning and through my installation I wish to support this – the courtyard is in the former location of Millbank Prison that was a holding facility before transporting prisoners to Australia. The mast design which is the basis of the installation was chosen from documentations of convict hulks and ships used for convict journeys to Australia in the 19th century. Convict hulks were mainly stationary and not suitable for travel, however ships used for convict journeys were usually regular merchant ships. I have used documentation of merchant ship size guides to calculate the mast and yard lengths of a 800 ton ship as the base proportions for the sculpture. Following the project, Anta’s long term plan is to be based in London and work internationally, including by connecting with communities in Latvia. She also commented: “Chelsea made me realise you can just make an exhibition happen!” Anta is also the winner of the ‘This is This’ award founded by Chelsea alumni James White, which enables a BA Fine Art graduate access to a studio with ACAVA for six months. Visitors can view Anta’s work in person until 30th August 2015. It’s open daily and can be seen from Atterbury Street opposite Tate Britain day and night, and will be illuminated every evening from 7pm – 9pm. The closing party will take place Thursday 27th August, 6 – 8.30pm, in the Green Room, 45 Millbank. Entrance is through the Henry Moore courtyard.